AirWatch Recieves Highest position in Gartner Magic Quadrant for Enterprise Mobility Management - Ocala, Gainesville, Orlando | Verteks Consulting, Inc.
Verteks Consulting is proud to be an AirWatch partner and we're excited about AirWatch's leading position in the Gartner Magic Quadrant for Enterprise Mobility Management. Every year, Gartner evaluates enterprise mobility management providers based on their ability to execute and completeness of vision. Vendors are then placed on a quadrant to represent their position in the market. Of the more than 100 companies in the EMM space, only five vendors were recognized in the Leaders quadrant. This is the fourth consecutive year we are recognized as a LEADER, receiving the HIGHEST position for our ability to execute for the second consecutive year. 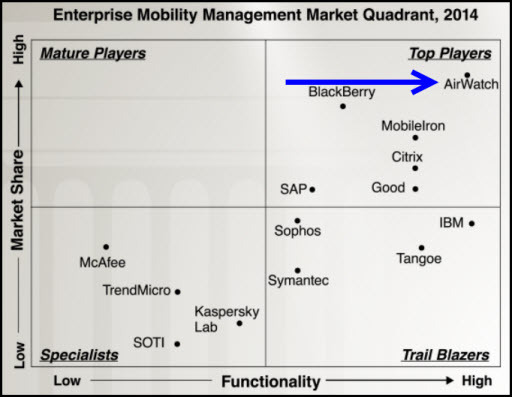 The Gartner Magic Quadrant for Enterprise Mobility Management was called the Gartner Magic Quadrant for Mobile Device Management Software from 2011-2013. Gartner does not endorse any vendor, product or service depicted in its research publications, and does not advise technology users to select only those vendors with the highest ratings. Gartner research publications consist of the opinions of Gartner’s research organization and should not be construed as statements of fact. Gartner disclaims all warranties, expressed or implied, with respect to this research, including any warranties of merchantability or fitness for a particular purpose.